You know the old saying...Give a man a fish and feed him for a day or teach a man to fish and feed him for life? Well...What the hey...I am going to do both right here! 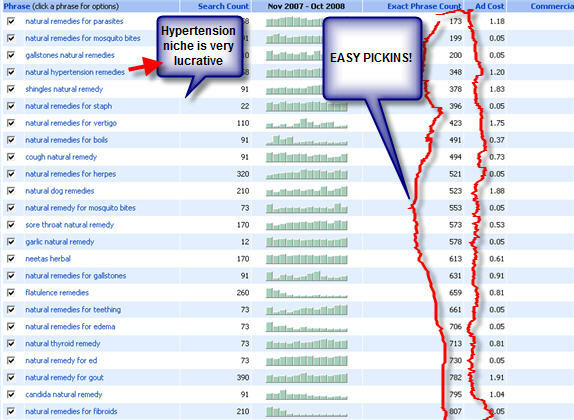 Let me show you some very juicy keywords...just waiting for an article...these are phrases that people are paying money for...but you can get listed on Google within a couple days to a couple weeks for free! So there is really 24 fish for you...and notice that some of these are in the health industry...there is fierce competition in this industry because it is so lucrative. But this old Bum Marketer found a few phrases that I can start earning cash with right away! Now in your "Bum Marketing" efforts you are likely to come accross weird phrases "mating rituals of llamas" and wonder if you should write an ad for that...here is what I do...I look at the "ad cost" column and see if anybody is paying 50 cents of more for ads...if they are... it is likely that I would write an article. That's not a hard rule to remember, is it? Now I can almost hear you saying..."Oh my God! I have to get some kind of fancy pants software"...NO!...You really don't...use the free resources I already gave you in the course...It will take a little longer...but stick with that until you have some sales under your belt...and then I would recommend investing in your business with Micro Niche Finder. So...let me give you even more phrases to get your creative juices going....and you will be able to write cash pulling articles and ads for months and months using these the way I have shown you above. So...again...If you have not started Bum Marketing...get started...there is big money waiting!